Vous pouvez également utiliser 20000 Kobo Super Points pour l'obtenir ! Analysing the reception of contemporary French philosophy in architecture over the last four decades, Adventures with the Theory of the Baroque and French Philosophy discusses the problematic nature of importing philosophical categories into architecture. Focusing particularly on the philosophical notion of the Baroque in Gilles Deleuze, this study examines traditional interpretations of the concept in contemporary architecture theory, throwing up specific problems such as the aestheticization of building theory and practice. Identifying these and other issues, Nadir Lahiji constructs a concept of the baroque in contrast to the contemporary understanding in architecture discourse. Challenging the contemporary dominance of the Neo-Baroque as a phenomenon related to postmodernism and late capitalism, he establishes the Baroque as a name for the paradoxical unity of 'kitsch' and 'high' art and argues that the digital turn has enhanced the return of the Baroque in contemporary culture and architectural practice that he brands a pseudo-event in the term 'neobaroque'. Lahiji's original critique expands on the misadventure of architecture with French Philosophy and explains why the category of the Baroque, if it is still useful to keep in architecture criticism, must be tied to the notion of Post-Rationalism. Within this latter notion, he draws on the work of Alain Badiou to theorize a new concept of the Baroque as Event. 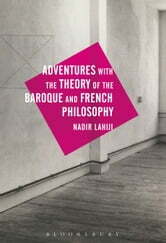 Alongside close readings of Walter Benjamin, Theodor Adorno and Michel Foucault related to the criticism of the Baroque and Modernity and discussions of the work of Frank Gehry, in particular, this study draws on Jacque Lacan's concept of the baroque and presents the first comprehensive treatment of the psychoanalytical theory of the Baroque in the work of Lacan.